Waiting Outside… will inspire audiences to rediscover the value of the small moments in life and to make the most of every one. The film centres on Simon who cares for his young daughter Scout while his husband Felix is deployed overseas. When Simon gets a serious diagnosis, his world is shaken and he must deal with it, and the future, alone. We hope it furthers a conversation on quality of life while shining a light on the challenges faced by people in similar situations, and the impacts those challenges have on them. October 29, 2018 (St. John’s, NL) – This weekend, Newfoundland and Labrador producer/director/writer Joshua Jamieson’s LGBTQ short film, Waiting Outside…, screened at The Scottish Independent Film Festival where it pulled out its second award win thanks to a stellar performance by one of its leads. The short film is about a father named Simon (Clint Butler) who cares for his young daughter Scout (Kate Dobbin) while his husband Felix is deployed overseas. When Simon gets a serious diagnosis, his world is shaken and he must deal with it, and the future, alone. The cast also includes performances from the incomparable Amy House, as well as Kyle Snow and Lisa Rose Snow. Following the screening in Edinburgh, Scotland, the film festival announced its 2018 award winners, and the Best Actor honours went to Clint Butler. Originally from Newfoundland and Labrador, Butler currently resides in Toronto, and was just recently cast as the swing actor for four roles in the Toronto production of the Tony award-winning Broadway and international smash, Come From Away. Earlier this month, Waiting Outside… won Best Short Film at the 2nd Annual Smith Sound Film Festival on home turf, in Clarenville, NL. Jamieson, whose family roots are in Swift Current, was on hand to accept the award. The short film has also so far been an official selection at FIN: Atlantic International Film Festival (Halifax, NS), the Nickel Independent Film Festival (St. John’s, NL), and was available through the Cannes Film Festival’s Short Film Corner. Waiting Outside… is also a selection in the Nickel Independent Film Festival’s touring Road Show. The film’s score is an original composition by ECMA award winning musician Rozalind MacPhail, who also co-wrote lyrics to the closing credits song with Jamieson. The script is based on a poem by Carmelita McGrath from her book Escape Velocity (Goose Lane Editions), and the film was also produced by Ruth Lawrence and shot by cinematographer Brad Gover. Waiting Outside… carries an endorsement from the Canadian Cancer Society-NL for its authenticity and realistic depiction. The film also won the NL Joy Award from the Linda Joy Media Arts Society for its outstanding script, which supported its three day shoot in August 2016 following Jamieson’s participation in the Newfoundland and Labrador Film Development Corporation’s film business development mission to Los Angeles, CA that summer. We hope it furthers a conversation on quality of life while shining a light on the challenges faced by people in similar situations, and the impacts those challenges have on them. Newfoundland and Labrador filmmaker’s LGBTQ short film Waiting Outside… goes international, again! October 3, 2018 (St. John’s, NL) – Fresh off its most recent screening as an official selection at FIN: Atlantic International Film Festival held in Halifax, Nova Scotia producer/director/writer Joshua Jamieson’s latest release – a short film called Waiting Outside… – will screen again internationally later this month. Jamieson recently announced the news that Waiting Outside… is an official selection of the Scottish Independent Film Festival on social media through his Twitter profile (www.twitter.com/jjmoxy) and on the film’s official Facebook page (www.facebook.com/waitingoutsidefilm). The film will screen in Edinburgh on October 26, 2018, and more details regarding venue and screening time will be forthcoming once the festival releases its full schedule. The film is about a father named Simon (Clint Butler) who cares for his young daughter Scout (Kate Dobbin) while his husband Felix is deployed overseas. When Simon gets a serious diagnosis, his world is shaken and he must deal with it, and the future, alone. The cast also includes performances from the incomparable Amy House, as well as Kyle Snow and Lisa Rose Snow. Waiting Outside… carries an endorsement from the Canadian Cancer Society-NL for its authenticity and realistic depiction. The film also won the NL Joy Award from the Linda Joy Media Arts Society for its outstanding script, which supported its three day shoot in August 2016 following Jamieson’s participation in the Newfoundland and Labrador Film Development Corporation’s film business development mission to Los Angeles, CA that summer. Waiting Outside… was ultimately fully completed in January 2018, and began its film festival circuit with availability at the Cannes Film Festival, specifically within the Short Film Corner. Within Newfoundland and Labrador, the short film was an official selection at the Nickel Independent Film Festival, which has also chosen it to be a part of its eventual road show lineup. The next local screening of Waiting Outside… will be in Clarenville, NL where the short is an official selection at the 2nd Annual Smith Sound Film Festival taking place October 12, 2018. Tickets for that screening are $10 and they are available now through the Eastlink Events Centre (www.eastlinkeventscentre.com); all proceeds from this screening will be donated to the local regional food bank. The cast and crew of Waiting Outside… in Bowring Park, August 2016 after wrapping. There’s some very exciting news to share about our short film! Waiting Outside… is currently available at the Cannes Court Métrage Short Film Corner in France this May 2018! The short film’s director and writer (as well as producer), Joshua Jamieson, recently sat down with a UK-based film digest called The New Current for an in-depth interview about making it to Cannes, how the project developed, and his artistic background. Check out the interview by visiting their article here, or click on the image’s caption below to access a PDF version. On the home front Waiting Outside… has been officially selected for the Nickel Independent Film Festival in June 2018! Stay tuned as other festival screenings are confirmed! We can’t wait to share our story! We are pleased to announce the cast of Waiting Outside… a few days before heading into production on August 20 and 21, 2016! We couldn’t be more thrilled about the talented actors we have lined up for the short independent film. Here is the cast list, and a little about each of them. Clint Butler is a classically-trained Canadian actor, born and raised on the beautifully rugged east coast island of Newfoundland (and Labrador). Trained initially for Musical Theatre, Clint began his performance career as a lead vocalist in the American cruise industry. Since then, he has performed on stages in Vancouver, Calgary, Regina, London, Ottawa, Toronto, Halifax, and St. John’s, as well as other great Canadian towns. A member of Canadian Actors Equity and ACTRA, Clint’s career spans from workshopping and originating new Canadian stage roles to ducking bullets on TV; musical and comedic repertory theatre to independent dramatic shorts. Notable credits: Guest Starring as Doug Randall in season five of Republic of Doyle (CBC); appearing as the grotesque and mysterious “Archivist” in season four of Lost Girl (Showcase/Syfy); and touring as “Bergeron” in Artistic Fraud’s critically acclaimed staging of Robert Chafe’s Oil and Water (Resource Centre for the Arts, Factory Theatre, Magnetic North, Neptune Theatre, The Grand Theatre, and Canada’s National Arts Centre), for which he has also been published as an original cast member. Kate Dobbin can most recently be seen in the Shallaway Choir and Ennis Sisters video for Sing You Home, the commemorative song to written and recorded to mark the 100th anniversary of Newfoundland’s role at Beaumont Hamel. She also appears in tourism ads for the province of Newfoundland and Labrador. Amy House is a comedienne, writer, actor, and producer. For the past 13 years she has been the Artistic Animateur of the RCA Theatre Company at the LSPU Hall. Amy has created several one-woman shows which she performs and tours, as well as several two-handers with Berni Stapleton, including A Tidy Package, In Stitches, The Importance of Being Foolish and Berni and Amy Rises Up. Her past film and television credits include Sherry White’s feature Crackie, Justin Simms’ short Heartless Disappearance into Labrador Seas, and The Halifax Comedy Fest TV broadcast. Kyle Snow just finished as a cast member in the Michelle Jackson award winning short Crocuses coming soon from Deanne Foley. He has also appeared in Ida Here and There, and as a background actor in the upcoming Netflix series Frontier. He additionally worked as a safety driver and stunt double on Braven, a new mini-series starring Jason Momoa. Lisa Rose Snow is an award-winning filmmaker and performer originally from Nova Scotia, Canada. As a performer she is known for her comedic roles, but has also played leading roles in dramas and genre films, including spots on Haven, Trailer Park Boys and All the Wrong Reasons. Her short films have won awards around the world, including Best Canadian Short (Silver Wave Film Festival), Audience Choice (San José International Short Film Festival), and the National Screen Institute’s Drama Prize. In 2013 Snow created Organic Water Productions Inc with long time collaborator and friend Lora Campbell. OWP is an independent production company interested in female-driven stories and underrepresented voices. Snow received a 2013 Wave Award from Women in Film & Television Atlantic, the first time this award has ever been given to an emerging artist. Snow holds an Honours Degree in Acting from Dalhousie University and is a recent alumni of the Canadian Film Centre’s Cineplex Screenwriter’s Lab in Toronto. Waiting Outside is a Linda Joy Award winning short script written and directed by Joshua Jamieson and co-produced by Blue Pinion Films (Ruth Lawrence) and m0xY Productions. It will be shot over two days, August 20-21, 2016. This low budget shoot is operating under the ACTRA AIP agreement. Synopsis: Simon cares for his young daughter Scout while his husband Felix is deployed overseas. When Simon gets a serious diagnosis, his world is shaken and he must deal with it, and the future, alone. Auditions will be held Sunday August 7, 2016 from 10am to 1pm. Scout – A smart and inquisitive young girl, Scout is around 7 or 8 years old. She has a few tomboyish traits and is fearless. Her two gay parents, Simon and Felix, have raised her to have an open mind, and encourage her to explore boundaries. She’s energetic and active, enjoying animals and being outdoors. Waiting Room Woman – A middle-income style-savvy travel agent in her early 40s who is a little presumptive, and supporting someone in her life affected by cancer. She sometimes speaks or comes to conclusions quickly without thinking, but always has the best of intentions at heart. Physician – An oncologist, new to his practice. He’s altruistic and deals directly but empathetically with his patients. Clinic Receptionist (non-speaking) – A freshly graduated young woman in her early 20s who has earned her first job in the medical administration field, even if it wasn’t her ideal first gig and she’s overworked. She’s somewhat flippant about it at times as a result. Please send photo & resume to: jjmoxy@gmail.com. Those selected for an audition will be contacted with the time and location. We’re just a week and a half away from our fundraising event scheduled for May 16, 2016 at Piatto Pizzeria + Enoteca. You can check out the Facebook event by clicking here. We’ll also be running a silent auction in support of the short film production running up to our Piatto party. So here are the details on how that will work and a preview of items that will be up for grabs. Be sure to revisit this post for updates as lots are added. The auction is anticipated to start online on or before Thursday, May 5, 2016. The auction will run on the ‘DISCUSSION’ tab of our Facebook event page (here). Images of the items and/or donor’s logo will be posted there with descriptions of the product or service up for bid. Place your bid by typing the your bid amount in as a comment on the relative photo. We’re Square equipped! So you can pay for your film production supporting purchase with any major credit card. We’ll also accept email money transfers or cash. Bidding is open to anyone in Canada or the United States of America. Certain lots will be auctioned online only, other select lots will continue their silent auction process at the Piatto event, and bidding on those particular lots will close at the conclusion of the event. If you are an active bidder on an auction lot that will close at the event on May 16 but you cannot attend, you will have the ability to submit your maximum bid amount privately by email for a proxy bidder to apply on your behalf at the event. All lots that are online only will close bidding at the same specified date and time, which will be indicated in the item/photo description. The last bid entered with a time stamp associated with the Facebook comment that is before the advertised closing date and time for bids will be the winner of the lot. If that is you, you will be responsible for paying the pledged amount. If your geographic location would require an item to be shipped should you be the successful bidder, please refer to the item/photo description to ensure the particular item you’re interested in can be shipped. Other questions? Or have something you’d like to toss into our auction? Contact us! We have some exciting news that we’re finally able to share with everyone! The co-producer and director/writer behind the upcoming short film Waiting Outside… (whose script won the 2015 NL Joy Award) has been selected as one of ten emerging and mid-level career producers to partake in a film business development mission to Los Angeles, CA. Jamieson directing Just Himself: the story of Don Jamieson on location in Ottawa, ON with cameraman Brad Gover in 2011. The delegation includes Jamieson and nine other film producers from Newfoundland and Labrador, and will be led by staff from the Newfoundland and Labrador Film Development Corporation. Working in concert with L.A. based consultant Peter Wetherell (President, Magus Entertainment Inc.) and script consultant/story editor Ruth Atkinson, strategic meetings will be scheduled with various individuals and organizations between June 6 and 10, 2016. Jamieson will also be a delegate at the ‘Produced By 2016‘ conference presented by the Producers Guild of America, which takes place on the Sony Picture Studios lot June 4 and 5, 2016. That conference features a number of professional development opportunities, panels, and roundtable discussions with confirmed presenters and panelists including Elizabeth Banks (Partner, Brownstone Productions; Pitch Perfect 1 & 2, The Hunger Games), Steve McQueen (12 Years a Slave), Russell Simmons (All Def Digital), and Morgan Freeman (President & Co-Founder, Revelations Entertainment; Invictus, Madam Secretary), plus many, many more! Sessions at the conference will feature discussions around the challenges and opportunities facing independent film producers, the current state surrounding film financing, social media marketing integration for film productions, and an opportunity to meet buyers from streaming broadcasters like Amazon, Hulu, and YouTube, among others. Jamieson is very much looking forward to soaking up as many case studies and experiences, and as much mentorship, as possible from the well-versed professionals on the mission. He’s exceptionally grateful for the opportunity, and is anxious to discover what opportunities exist for Waiting Outside… and the m0xY Productions in-development documentary Winter’s Second Chance. Find a little Joy for Waiting Outside… in this week’s Herald! We were so surprised and thrilled when the latest issue of the Newfoundland Herald rolled off the press and into shops this Monday past! On page six of the January 10 to 16, 2016 issue featuring the Royal family on the cover, there’s a lovely little piece about our short film’s big success! Pop out and pick up a copy before they’ve left stands, or click on the image in this post to see a PDF of just the article itself. Many thanks to the Herald and its staff for including our news about winning the NL Joy Award from the Linda Joy Media Arts Society! Click above for a PDF of this release. December 1, 2015 (St. John’s, NL) – The Joy Awards, managed by the Linda Joy Media Arts Society out of Halifax, NS have announced 2015 recipients, and a short film being co-produced by Joshua Jamieson and Ruth Lawrence called Waiting Outside… has won the NL Joy Award. The 2015 award benefits include $7,500 in rental services from Atlantic Studios Cooperative, $2,000 in post-production services and $500 towards production equipment rental from the Newfoundland Independent Filmmakers Cooperative, and $1,200 in script consultations by John Doyle. The award is open to residents of the province and past recipients include Roger Maunder, Christian Sparkes, and Jordan Canning. The short film, which has been endorsed by the Canadian Cancer Society-NL (CCS-NL), focuses on a single father who is fighting for his life while striving to make the best possible one for his eight year old son. 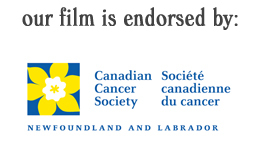 Of the project, CCS-NL said “we feel the film will present a relatable and realistic life situation through its main characters, and will further support and encourage an important public dialogue surrounding the circumstances and challenges those living with cancer may face,” in their letter of support. The script for the film was inspired by a poem of similar name, Waiting Outside Clinic 2B, which appears in Carmelita McGrath’s book Escape Velocity (Goose Lane Editions). The script is currently in its third draft, and will continue to evolve prior to the eventual production phase which will take place sometime in 2016. Also on board for Waiting Outside… are Brad Gover (cinematographer) and Darryl Couch (animation/editor), both of whom worked on Jamieson’s Just Himself: the story of Don Jamieson. Musician and film composer Rozalind MacPhail joins Jamieson for the first time on this project, and she has scored films for Lawrence and many others in the past. She recently performed a live score for Ingrid Veninger’s He Hated Pigeons at the St. John’s International Women’s Film Festival and at the Cucalorus Film Festival in Wilmington, North Carolina. “I can’t wait to bring this film to life, to highlight brilliant locations like Bowring Park in the city of St. John’s, and to tell these stories. I hope the film will inspire its audiences to rediscover the value of life’s little moments, and to make the most of each one,” Jamieson added. The production, thus far, has been supported by the City of St. John’s through its arts grant program, some members of the corporate community, and private donations. Additional funding partners are expected to come on board in the near future, and details on how to make contributions to the production can be found at www.waitingoutside.ca. Private contributions are processed using Square to ensure they are secure. It has been a little while since our last public update on our short film project Waiting Outside… so we thought it was high time that we shared a little news! Over the last few months, our original script has evolved from its initial incarnation to a second draft, and it’s now in it’s third draft! The film is getting tighter, the story more focused. We have also applied to a number of development and funding opportunities. Some are in the final stages of confirmation, and others were unsuccessful. Par for the course, and we’re encouraged by the support we’ve received thus far, and will continue down other avenues to ensure this film gets made. We will be applying to the NL Joy Award this week, and if fortunate enough to be selected for that based on the artistic quality of our work and the value of our message, that will help us with a number of services and stages. We’re also hoping to network with some new corporate partners to introduce them to our project and discuss how we can help them, and how they can support a strong film about real life people and challenges that come along with facing cancer. If you’re reading this and fall into that category potentially, feel free to get in touch – we’d love to hear from you. On a final exciting note, Rozalind MacPhail, a musician bursting with talent who will be scoring our short film is in the news today as her latest performance approaches. As part of the St. John’s International Women’s Film Festival, she will be performing a live improvised score to Ingrid Veniger’s feature film, He Hated Pigeons at the LSPU Hall this Saturday, October 24 at noon. You can read more about that here.